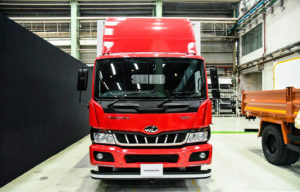 The legendary Italian designer Pininfarina took the change to design another truck. After the not verry succesfull Turkish BMC trucks he now worked on a new Mahindra truck. The Indian Mahindra Truck and Bus Division proudly presents the Mahindra Furio Medium truck range. To us it looks like any Asian medium truck and we recomend Mr Pininfarina to stick to passenger cars in the future..
← New Actros on its way!